STUDENTS OF AMITY UNIVERSITY also participated in Art Fair 2017 in which seven students are from B.F.A. (Bachelors in Fine & Arts) 1st Year and one student from M.F.A (Masters in Fine &Arts). All the students belong from different cities. Like Delhi, Ajmer, U.P etc. All students have different interests to create an art like Abstract Art, Realistic Art etc. All have come here to study in Jaipur. 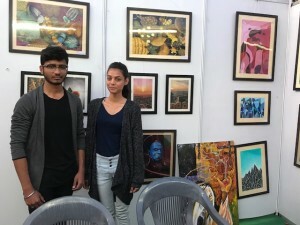 Students are Apurva, Mohit, Mehul, jyotika, Saloni, Ashish, Anurag and Milab has done their 1st group show at Art Fair (Kala Mela) 2017 and had a great experience.